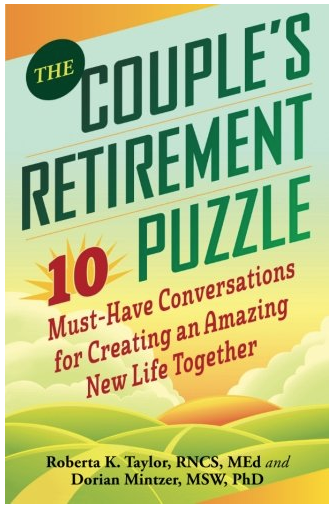 We liked this book, The Couple’s Retirement Puzzle: 10 Must-Have Conversations for Creating an Amazing New Life Together, from the get-go. It is different and wise because it focuses on retirement planning for both people in a relationship. The co-authors, Roberta K. Taylor and Dorian Mintzer, are both experts in positive aging and life planning. They have long careers and advanced degrees in psychology and coaching. Their book guides us to envision, discuss and strategize how to build a rich and satisfying retirement experience together. “What if you are looking forward finally having time to experience all the richness city life has to offer — but your partner dreams of moving to a cabin in the woods?” they ask. 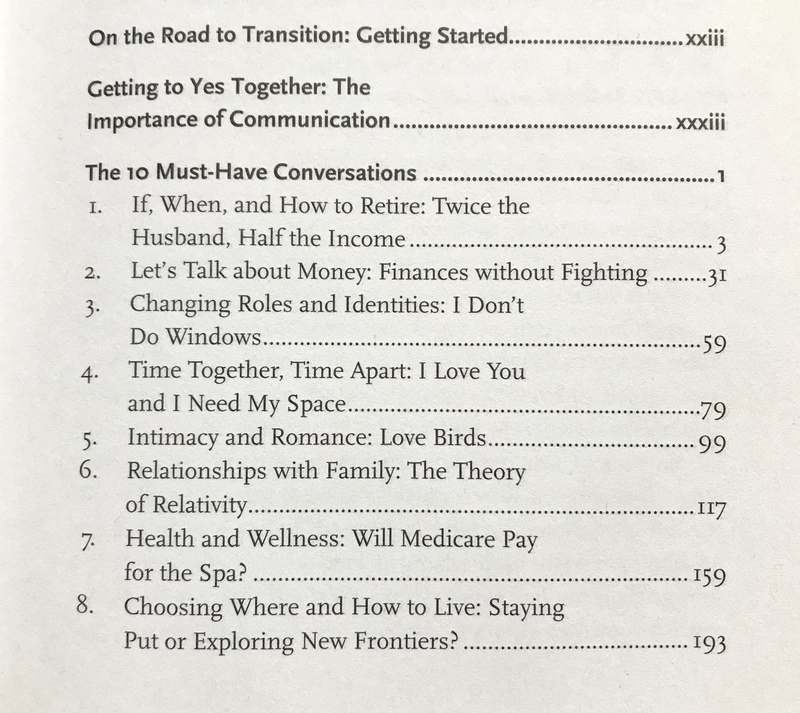 “Sometimes you might be surprised by your partner’s vision for the years to come, especially if you haven’t discussed it.” The book outlines exercises to do separately and together to share thoughts and plans. The goal is to create and refine a Shared Vision—one you will revisit together with your partner and tweak as the years go by. Where to spend your retirement is obviously a key question. Jim and I have no disagreements on where to live. We have a rent-stabilized apartment in New York City — the holy grail of living affordably in the city— and we inherited my family’s home near the Gulf Coast of Florida. But for couples whose options aren’t as settled, I can easily see the potential for conflict. It’s important to carve out ‘alone time’ in a way both partners find rewarding. As I write this, I’m alone at in our apartment in New York City. Jim stayed in Florida a few weeks beyond our visit for his birthday to work on home repairs. It is good for him and for our house that he can take this extra time in Florida, more time than my work allows. We talk at 8am each morning, and when we’re back together it’s all the sweeter. Friends have asked us how we manage to live in such a tiny New York apartment without being at each other’s throats. Part of the answer is that having a little time apart helps: it is good for both of us. That is good to know, especially since we plan to keep both the tiny apartment and the inherited house throughout our retirement. We’re just at the beginning of our retirement planning, and I’m very glad to have found this book while we are still in our pre-retirement years. Creating a Shared Vision with your partner is a process. I see us returning to this book again and again. Just like the financial side of retirement planning, the Shared Vision isn’t something you do just once. You need to revisit the plan, evaluate whether you are on track to reach your goals, and if necessary make adjustments. We share that sentiment. So do most of our clients. We don’t want to be a burden on our kids, either. Who does? We think of our LTC insurance as providing protection for our entire family, not just for us. Dorian qualified, when we corresponded, that LTC insurance isn’t for everyone — “not everyone can afford it and some people don’t qualify because of pre-existing medical conditions.” The important thing is to plan ahead and find some way to create an emergency fund or and/or set aside funds for future medical expenses. See the links below for more on the authors and their important work for positive aging and retirement.